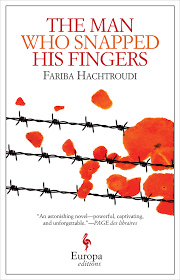 The Man Who Snapped His Fingers by Iranian author Fariba Hachtoudi is a short novel about love in a time of totalitarianism. The totalitarian regime in question is known only as the Theological Republic and its leader as the Supreme Commander, giving the novel an allegorical power, but no doubt drawing on Hatchtoudi’s experience and knowledge of Iran, which her family left after the 1979 revolution when she was a young woman. Appropriately for a novel concerned with love, the story unfolds in two voices, but these are not the voices of lovers, though their developing relationship is the novel’s subject. The first is that of Vima, or Bait 455 (the word ‘bait’ refers to prisoners who are taken to make other prisoners talk), who was tortured at length by the regime before being allowed to leave the country; the second belongs to one of the Supreme Leader’s most trusted Colonels, a man whose job it was to spy on the torturers to ensure they could be ‘trusted’. He, too, has now fled his homeland and has been seeking asylum for a number of years; he encounters Vima in her capacity as an interpreter at the Office for Refugees and Stateless Persons. Both have left loved ones behind, the single voices of their narratives in fact emphasising their loneliness. The Colonel’s weakness is Vima’s strength, though arguably in both cases love brings them suffering, and separation. Hachtoudi uses the Colonel and Vima’s perhaps unlikely love stories to reveal how totalitarian states work, both by describing the Colonel’s rise to power, and Vima’s treatment as a victim. The descriptions of Vima’s torture holds nothing back as she is both physical and sexually abused. That the torturers themselves are also under observation reveals the totalitarian mind-set. The Colonels’ story shows how his participation in (presumably the Iran-Iraq) war leads to recognition and admission to the Supreme Commander’s inner circle – from which, of course, there is no escape. In both cases it is the regime which tears their relationships apart. In Vima’s case this happens literally through imprisonment, but also through her fear Del might have betrayed her. For the Colonel, it occurs when his two roles as loving husband and brutal soldier collide. That his wife is also called Vima highlights the contrast. It is Hachtoudi’s ability to engage with her characters, the roles they are assigned by history, and how much power they have to reject them that makes this a gripping examination of totalitarianism’s perpetrators and victims. You are currently browsing the archives for the Fariba Hachtroudi category.